Citroën C3 Picasso Performance, Engine, Ride, Handling | What Car? Citroen C3 Picasso buyers can pick from just two engines: the Puretech 110 petrol and the BlueHDi 100. The Puretech 110 is a three-cylinder turbocharged 1.2-litre engine that produces 109bhp and 151lb ft of torque. It’s a really good engine that offers up plenty of punch and doesn’t feel overworked on the motorway. The other option, the BlueHDi 100 diesel, puts out 98bhp and 187lb ft of torque. The extra pulling power makes the diesel a little more relaxed than the petrol, and you rarely have to work it hard to make good progress. The Citroen wafts along serenely thanks to its supple suspension. The soft set-up does cause the body to bob up and down on undulating roads, but the Picasso doesn’t get too out of shape through tight twists and turns. It never makes you feel uncomfortable, either. Sharper bumps can cause a bit of a thud into the cabin, though, but not to the extent where it starts to become annoying. The ride’s good on the 16in wheels found on Edition models, too. Platinum versions get 17in wheels but we’re yet to drive a car with those on. The Citroen’s steering is usefully light around town, so manoeuvring it at lower speeds and parking it in tight spaces is easy. Fortunately the steering gets heavier at higher speeds, too, providing a reassuring feel. Consequently motorway trips don’t require an overly firm grip on the wheel and lots of constant corrections. You don’t get the same sense of connection that you get from a Ford B-Max, but it handles in a fairly composed and easily judged fashion otherwise, making it a pleasant and easygoing companion on the road. After all, small MPVs aren’t primarily about driving fun. Some wind noise can be heard around the windscreen and the standard-fit roof rails. 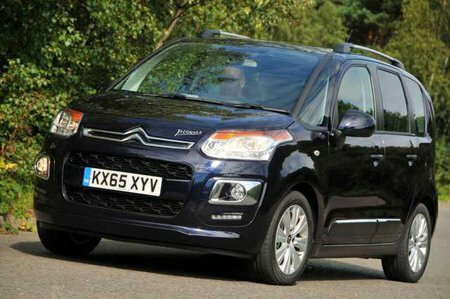 However, the C3 Picasso is otherwise a refined car. Road noise is low and the engines are generally smooth and quiet. We’d go for the Puretech petrol if you want the most refined engine option, though. The gearbox isn’t the slickest you’ll ever use, with a vague shift and long throw, but it’s easy enough to get the right gear.